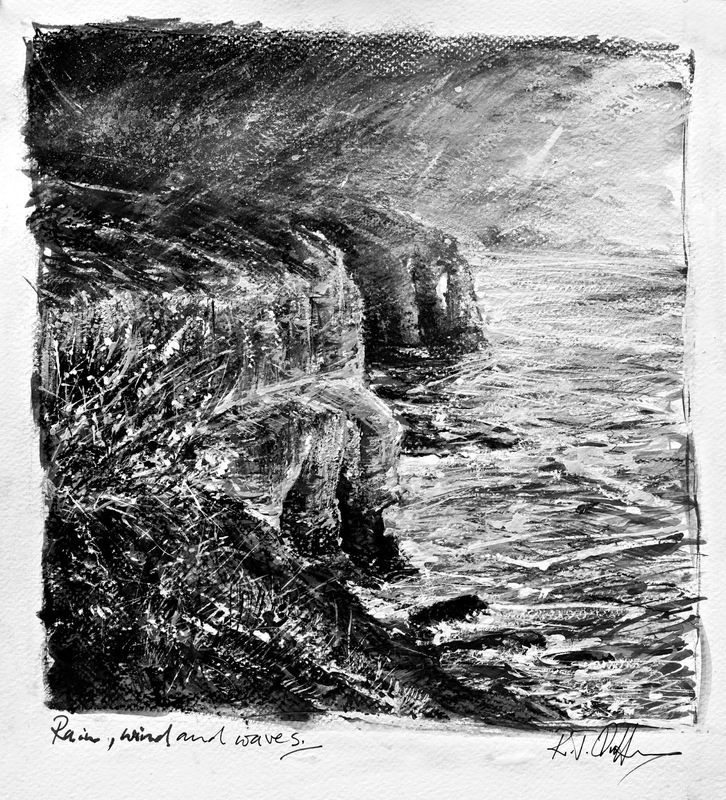 I've just put the finishing touches to this seascape sketch and very pleased with it I am too! I read somewhere that someone assessed that the amount of work Picasso was able to do equated to doing at least one painting a day. Well all I can say is that he must have had a string of minions dong his admin, his articles, his paperwork, his promotion and everything else to leave him in peace to paint! For us lesser mortals we must content ourselves with buying plenty of long candles to burn at both ends with stocks of midnight oil in the cupboard as well. So, there is a great deal of personal satisfaction in finishing this sketch after returning home (having travelled some distance north) from a one to one teaching day. Now...back to the studio to get everything ready for the framers tomorrow! A well deserved cup of tea! I'm currently working at full tilt. I'm painting, sketching sorting out framing, organising the Autumn workshops and next years workshops, art courses, residential art breaks and demos, designing (yes I still do that), writing, packing work for open shows, sending it off...you name it, I'm on it! 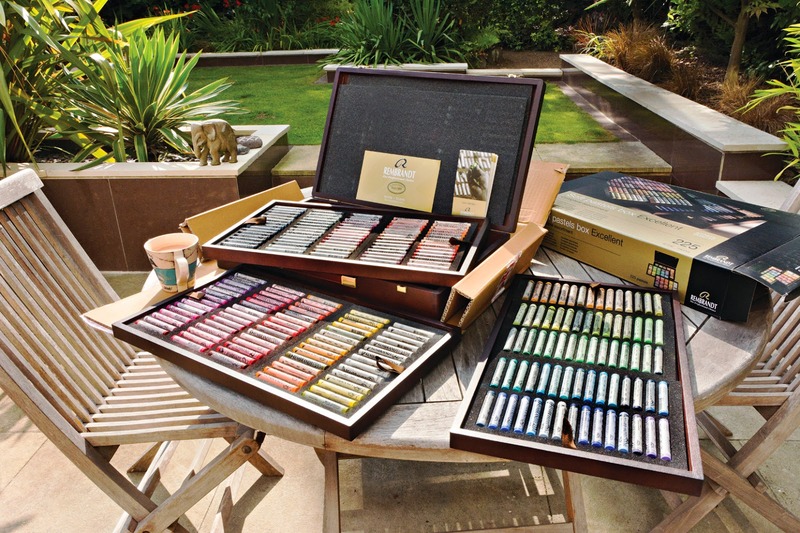 and put a bit towards the full set of Rembrandt pastels and..hey presto along comes this full set of 225 beautiful soft pastels from this great independent art supplier http://iartsupplies.co.uk/ a little later on. Fantastic! Next job. Time to strip off all those labels and start to break the pastels (at least in half) AND THEN start to use them! Yes that's right, practice what I preach. The broken pieces allow you to create such great marks you know! The pastels can only look pretty for so long....well, for the time it takes me to drink that tea whilst having a small break, enjoying the last of the days sun, listening to the birds... and reflect on this marked achievement at least. It's almost a year to the day too since I took the plunge and decided to leave the office behind to paint full time. Winning awards for my work really does inject a self confidence boost and helps to know that the decision to go solo, follow my heart with a clear straight head was the right thing to do. I'm going to have plenty of opportunities to put these pastels through their paces very, very soon! It's back to the East Coast for me this weekend! Bempton most likely. I just cannot keep away from those dramatic cliffs. The Gannets for the best part may well have gone, the Puffins too but the Gulls and the Kittiwakes will remain. Another great opportunity to get out there and work directly outdoors to create more expressive pastel paintings for the 'All Paintings Great and Small' show we are having at the visitors centre at Sutton Bank in April next year! Then there are all those shared skills to demonstrate for all my students on different classes, course, residential art breaks, between creating all those paintings. Exciting times ahead. Now...lets get pealing those wrappers off! 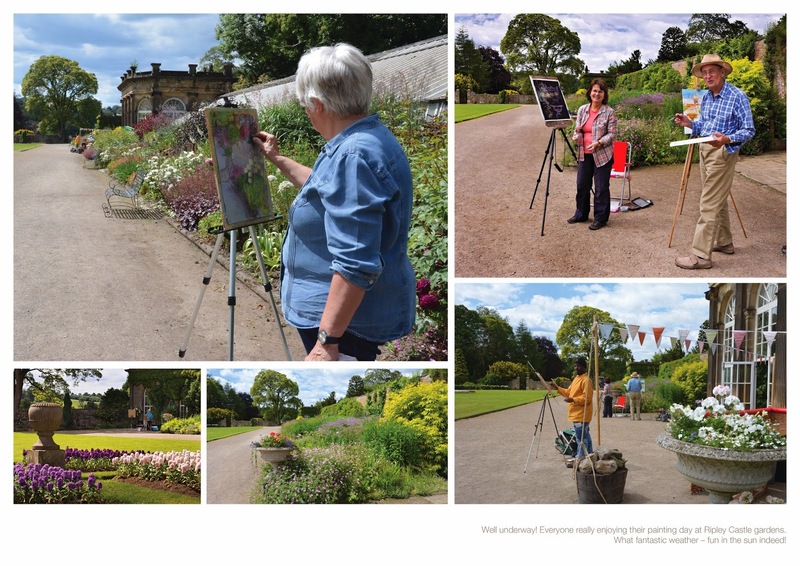 Budding art students within Ripley Castle walled garden! 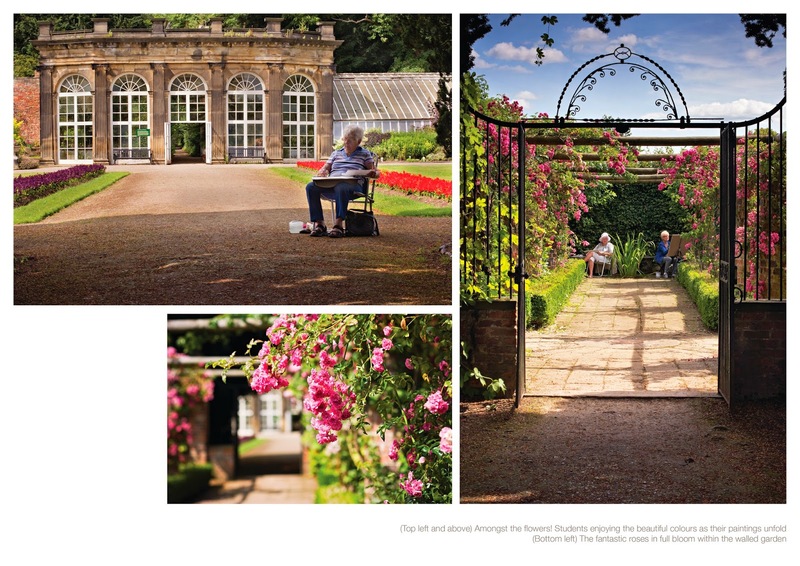 It's always a delight to be back at Ripley, the lovely picturesque village north of Harrogate, especially when I get the chance to visit the beautiful well kept walled garden in the grounds of Ripley Castle itself! 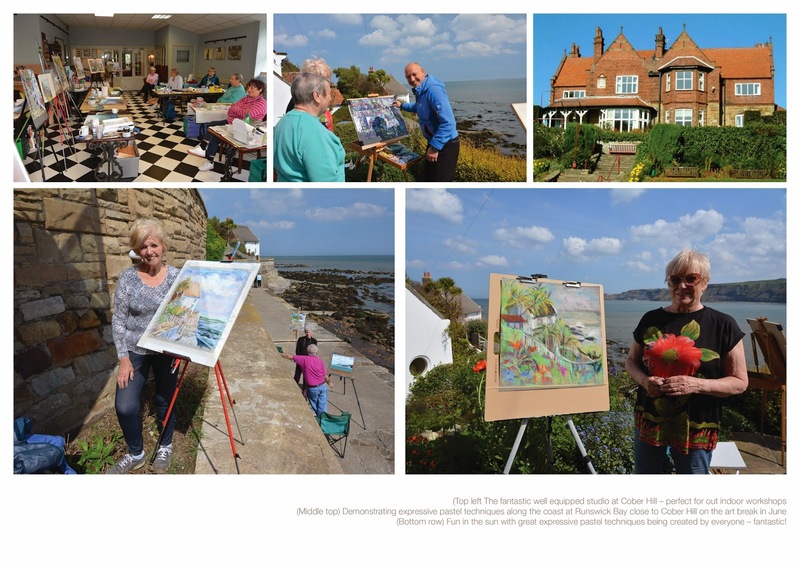 I got the chance to return again on Monday 21st July 2014 to teach 5 keen students who were on the all inclusive superb value for money mini art break organised by ‘The Boars Head’ in the centre of the village. The keen group of students (having spent the night in luxury accommodation this lovely historic coaching inn) met me at The Boars Head in the morning and sharing a lovely coffee we got to know each other a little before heading off to wonderful walled garden to paint and draw and discover all the hidden corners and inspirational compositions in the garden for which there were many. 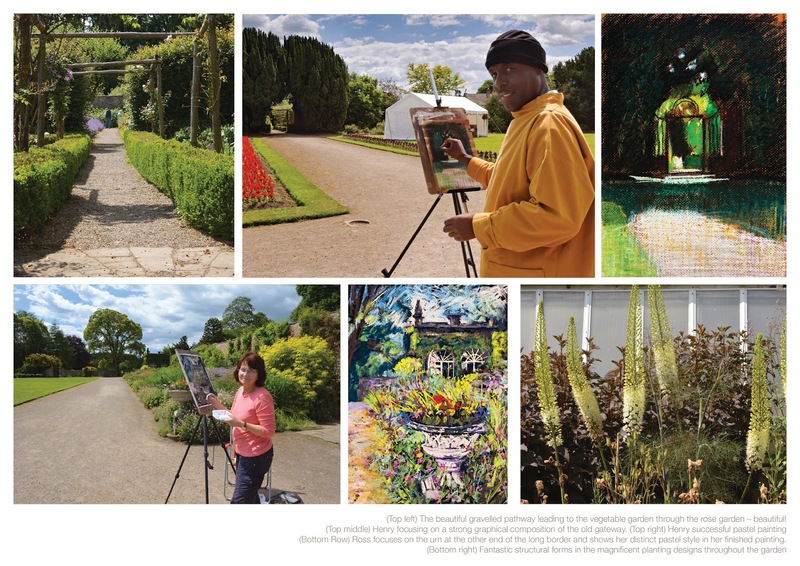 The Summer sun was certainly showing the garden at its best as we walked and talked and I explained how to assess various aspects of the walled garden to create really different and exciting colourful compositions to draw and paint. Guiding students every step of the way throughout the day, first with an initial short demonstration in pastels showing how to simplify the subject, soon after everyone created the initial foundation too on which to base their afternoons work. The first stage complete we meandered through the garden back to The Boars Head for a well earned break and a lovely light lunch in the exquisite dining room – all very sophisticated! After lunch and during the rest of the afternoon everyone’s paintings soon began to take shape. Working from shady positions the Summer sun shone gloriously filling the gardens with deep shadows and sunlit areas filled with superb colour. With group and one to one tuition throughout the day it was great to see how everyone explored their chosen compositions so well. 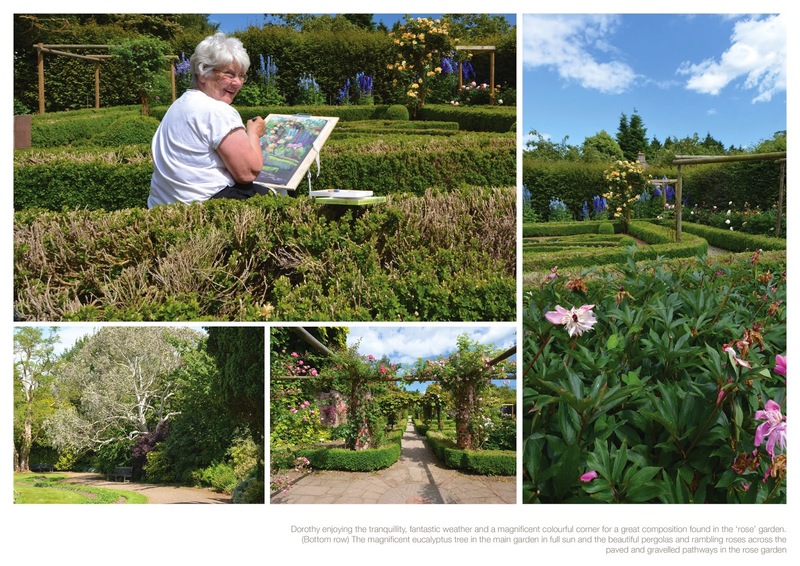 Surrounded by nature at its best, helping everyone with different levels of ability and experiences build their confidence exploring new and exciting ways to paint in this beautiful inspirational garden, was very rewarding for all. 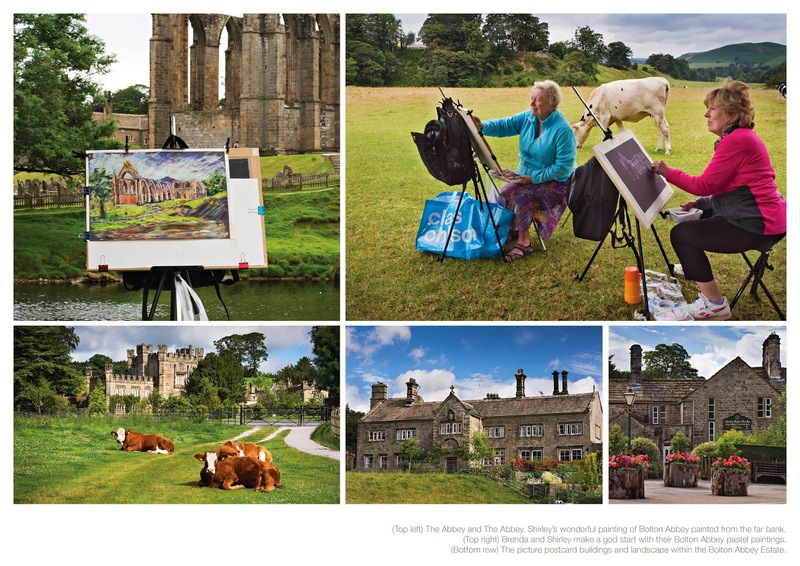 New and exciting all inclusive mini art breaks at The Boars Head on the Ripley Castle Estate are planned again for later in the year in the Autumn. 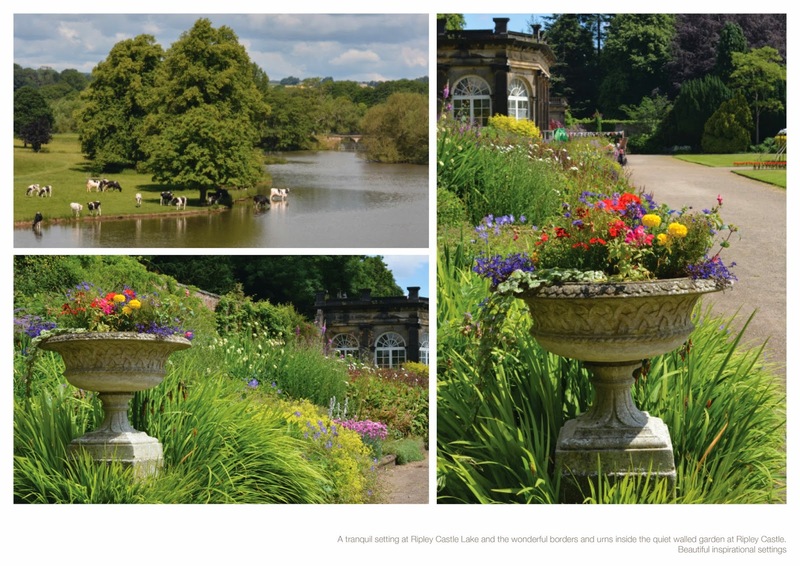 We will be exploring the beautiful vistas over the tranquil waters of Ripley Castle lake with all the shimmering light and overhanging trees! Now that’s something to look forward too! Early booking strongly recommended to secure your place as places are limited. I'm delighted to announce a new booking for October this year at Cober Hill! 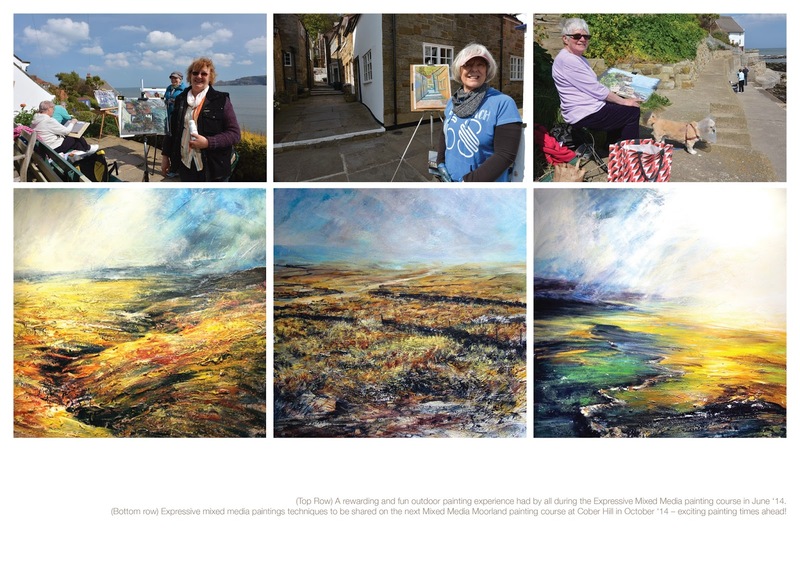 The dates for your next 'Expressive Mixed Media' residential art break are from Sunday 5 October to Wednesday 8 October 2014. 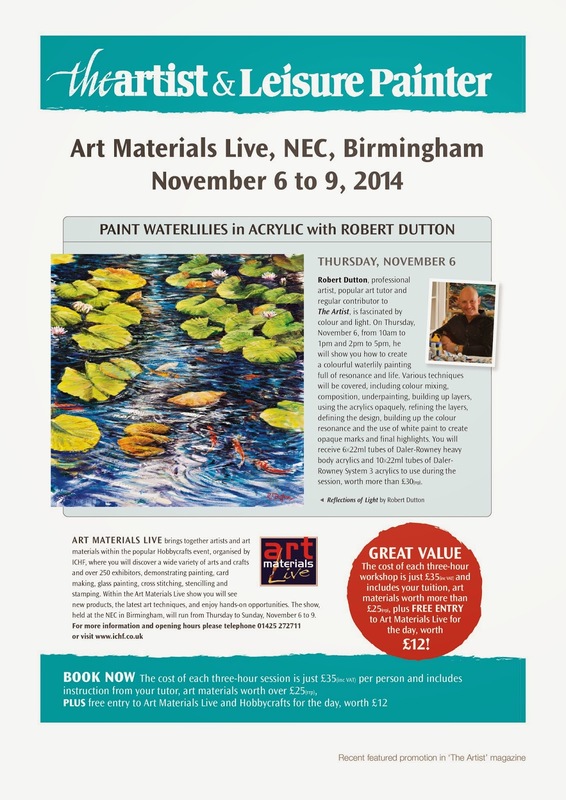 4 days of great painting activity in a fun learning environment shared with like minded people. Fantastic! It seams you all had such a greta time in June this year learning lots of new art techniques from me and with the course being such a success, I've been asked back...which is great! This time we will be focusing on the unique landscape and the moors close to Cober Hill. The moorland landscape along this stretch of the coast in October is truly stunning! No other high moorland landscape I know of along the east Coast of Yorkshire has such beautiful tall, twisted, weather beaten pines acting as sentinels along a moorland skyline as here! 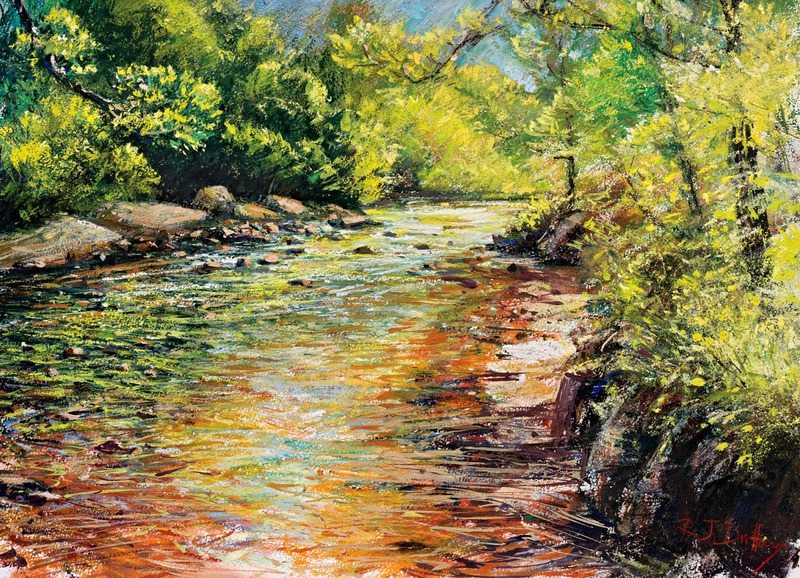 Really dramatic landscapes and perfect for both outdoor and indoor studio mixed media paintings we will be exploring to your full potential (and more) creating some really dramatic paintings. For anyone who hasn't been to Cober Hill before your accommodation is really great and the views over the sea are quite superb! 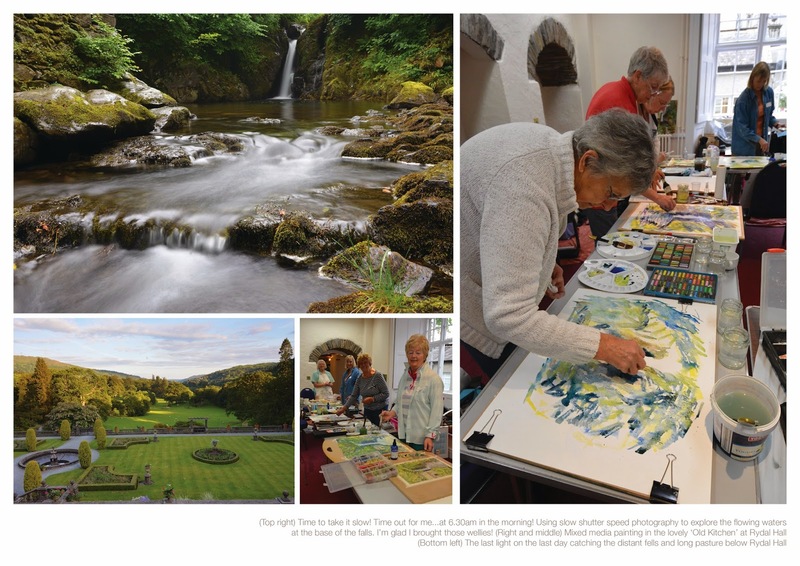 Cober Hill has been running well organised specialist themed breaks for many years so it is the perfect venue for our Autumn painting break. This exciting course exploring a wide range of techniques with different media and is suitable for all adult education art students regardless of level and ability who wish to explore something new. Here are just a few of the sorts of paintings and techniques I'll be teaching you. A list of what to bring for your art materials can be provided by contacting me direct on 0113 2252481 or emailing me at rdcreative@ntlworld.com. 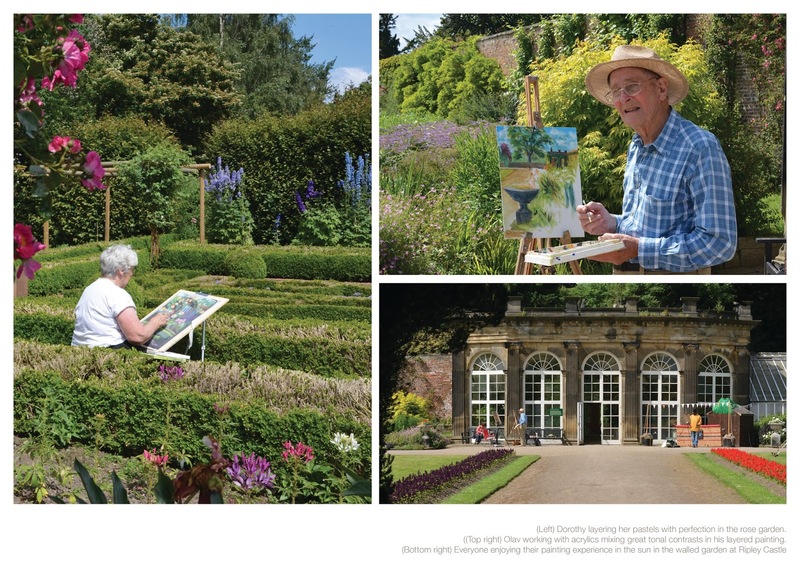 Newby Hall has it all - superb gardens with fantastic design and colour, intimate smaller garden settings, ponds, statues, sculpture trails through tranquil woodlands, a beautiful majestic famous elegant Hall - we were just spoilt for choice for painting subjects. 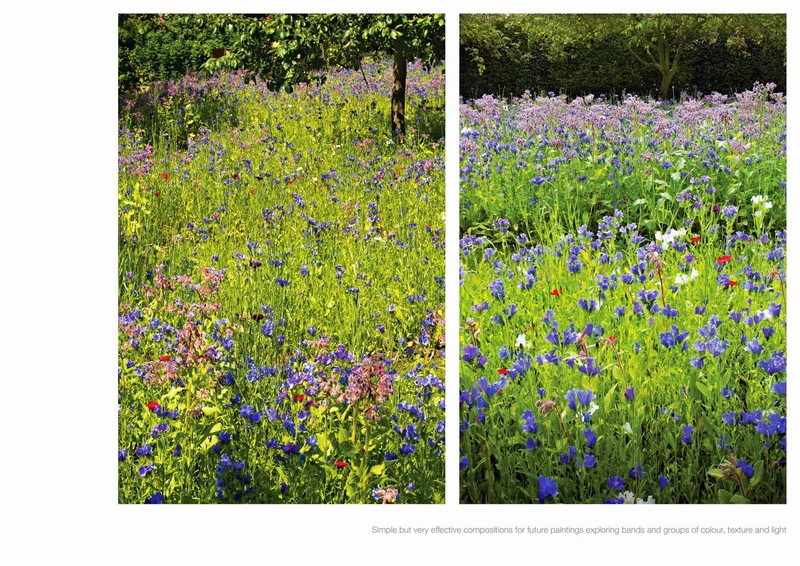 Our workshop on Friday 11 July began with a meander through the gardens looking at the different corners whilst I explained the options for many colourful compositional choices to paint. we were not disappointed - there was many! 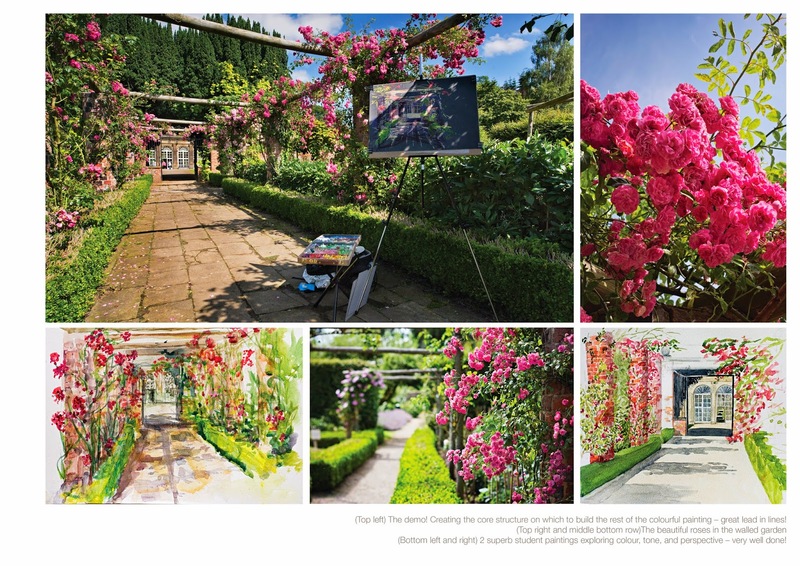 Soon after we all returned to the famous 'long border' with beautiful planting leading the eye perfectly to the majestic Hall itself to give a demonstrations with pastels how to tackle both plant and architecture in the same painting. Explaining about shape, colour, proportion and form, everyone soon got started to expressively apply these techniques to their own colourful paintings - and what great results too! 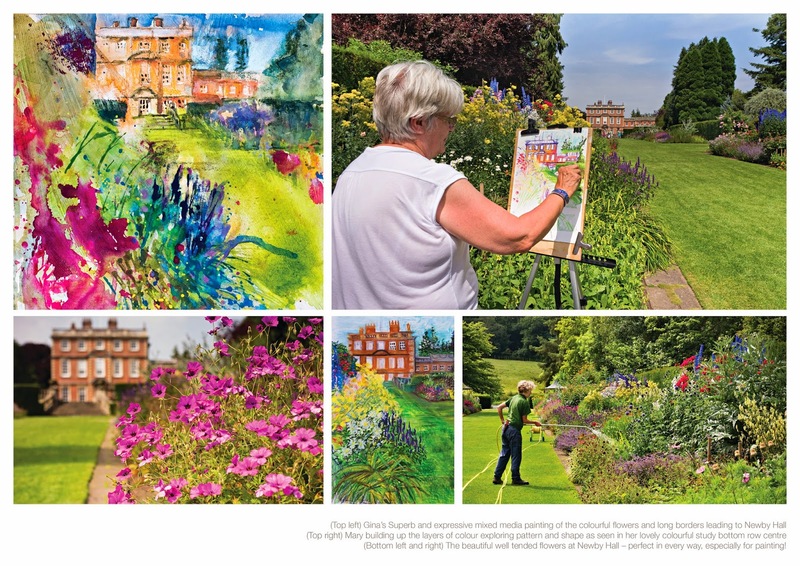 The weather was just fantastic - another hot Summers day bringing out the best in the borders and colours and the best in everyone's work using paint and pastels. Fantastic! A superb day had by all and lots more skills learned by everyone and a great experience had by all. A really rewarding experience for everyone. Just as a reminder, Autumn workshops at Follifoot Village Hall near Harrogate start 11 October rolling out the new season with 'rolling waves' - pastel and Watercolour in combination! I'm taking bookings now for them all so do let me know ASAP to secure your place. Class number for the full day workshops limited to 16 remember! 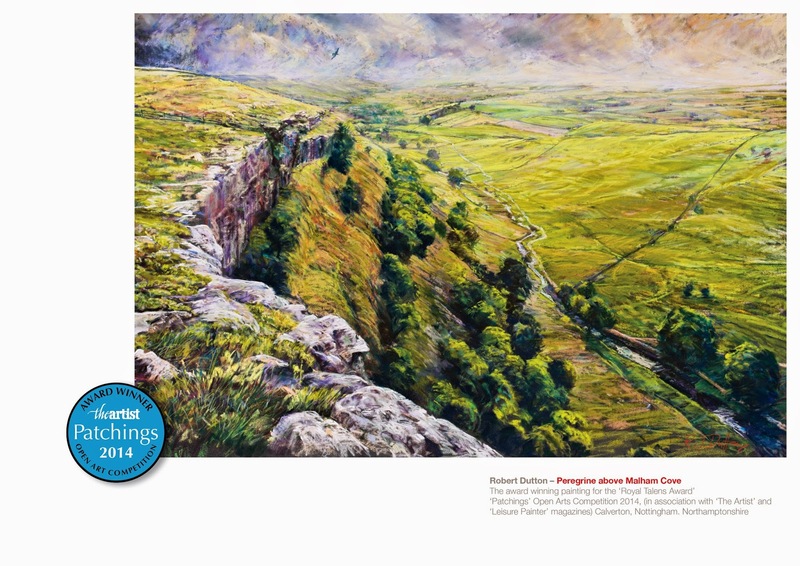 Finally I got to finish this demonstration piece of 'Spring light - Upper Wharefedale, the Yorkshire Dales' created for Selby Art Society one fine evening on 2 June 2014 on Clairefontaine pastel mat done! Such is the busy life of a professional artist! Managing Director of the SAA (Society of All Artists) on the same day I was invited to go to SAA in Newark to be filmed demonstrating pastel techniques. I've used the pastel mat ever since and think it is absolutely great. it suits my expressive and impressionistic style perfectly! OK, I admit, I wasn't demonstrating a landscape Dales painting but you get the picture...or rather Headrow Gallery in Leeds did once the painting was completed! Headrow Gallery. 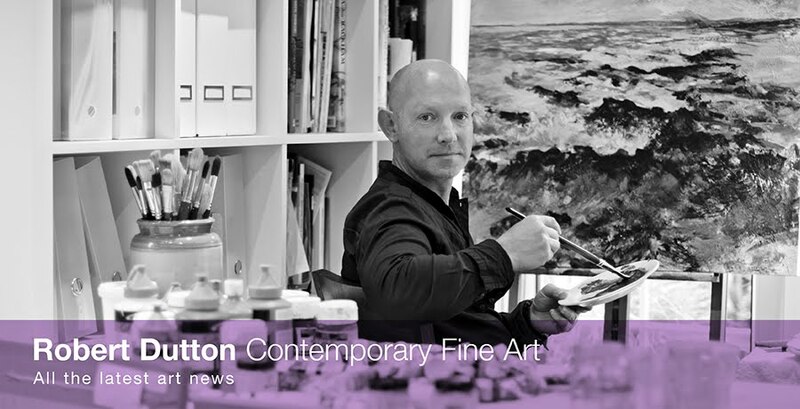 588 Harrogate Road, Alwoodley, Leeds LS17 8DP, West Yorkshire, United Kingdom Tel : 0113 2694244 / Email : info@headrowgallery.co.uk. 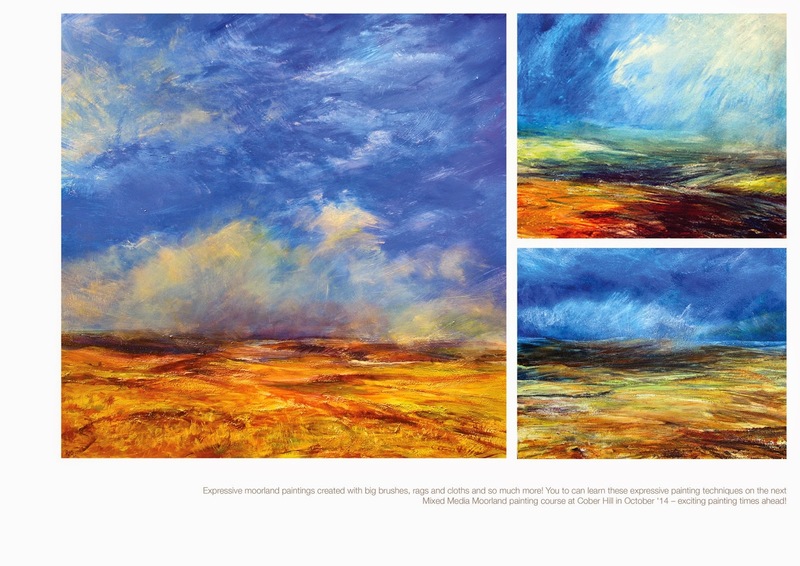 Our April exhibition at ‘The Inspired Gallery’ (Sutton Bank visitors centre) displays all our wonderful paintings paintings inspired by areas within the North Yorkshire moors boundary and here it is, the national park itself! Once image but a big area to cover and plenty of subjects within. There are some superb views ranging from the wild open heather moors, quaint fishing villages and harbours and dramatic coastal views. The wildlife in the North Yorkshire Moors National Park is rich and varied and we are all really excited to show you just whats out there! The official countdown to the exhibition begins now...40 weeks and 10 paintings the target from us all at least! Time to get busy with those brushes! We are already setting some paintings aside for this exciting exhibition. 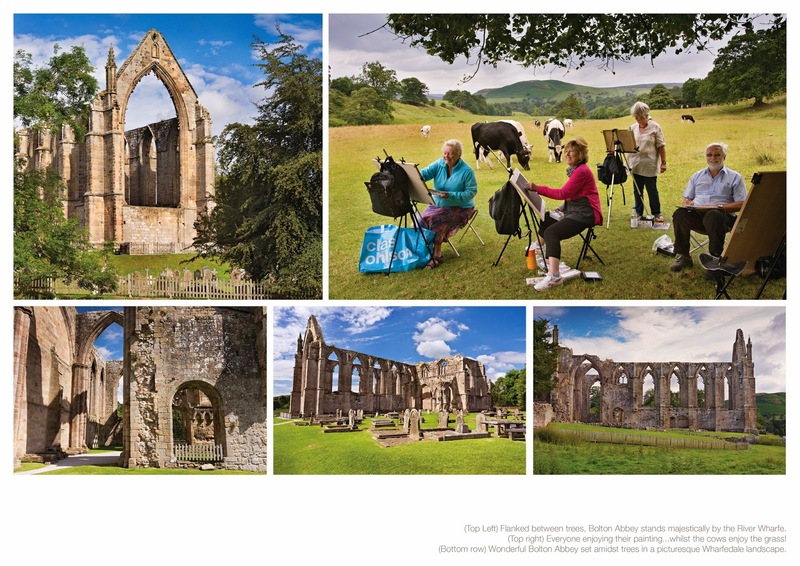 A date for your diary - Friday 17 April until Monday 4 May 2015, The Inspired Gallery’ Sutton Bank visitors centre. More to come! I'll keep you posted. Its quite amazing how the introduction of a new paper you have never tried before can quite simply change your direction and inject new vigour into your work. Recently road testing a collection of ‘new’ watercolour papers for Canson as part of a series of 4 articles for ‘The Artist’ magazine directly putting 4 mills and their papers under the spotlight, I was really impressed by this ‘Vidalon’ 300gsm (140lb) ‘Prominent Grain’ paper. For the rest of the review you will just have to wait until the article is released in the magazine in the November ‘14 issue. The magazine is well worth buying...and so are the Canson papers! I’ve been back from Rydal Hall teaching a full class of students for only a short while now (as I write this) and already I’m missing it all. 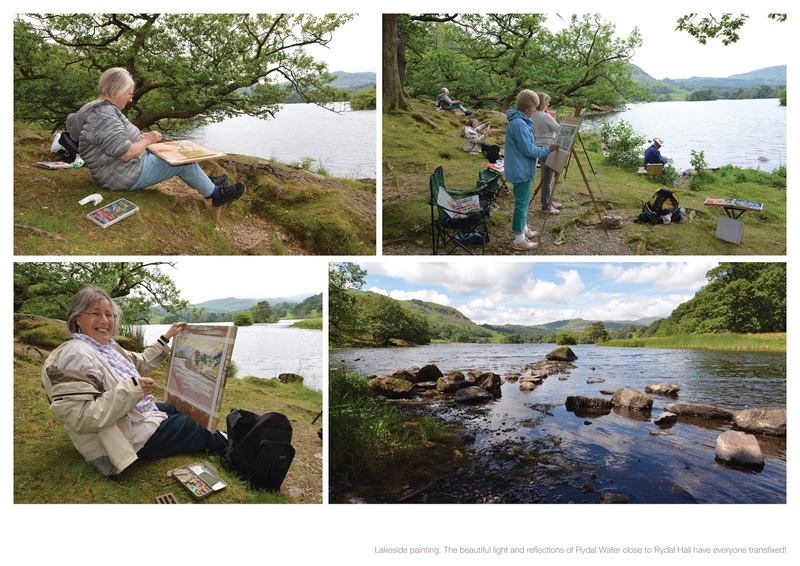 We all had a wonderful experience throughout the week drawing and painting outdoors around the beautiful inspirational grounds at Rydal Hall, lakeside at Rydal Water and in the ‘old kitchen’ art studio cooking up some creativity! On Monday afternoon after settling in, we headed for the tumbling waterfall and The Grot’ - a fantastic idyllic setting in the heart of the grounds. “The Grot” at Rydal Falls is described in William Wordsworth’s early poem, ‘An Evening Walk’, published in 1793. (The Grot was once a summerhouse designed for viewing the waterfall and became a major attraction for a succession of visiting artists and writers in the 18th and 19th century and for us on our first day too! 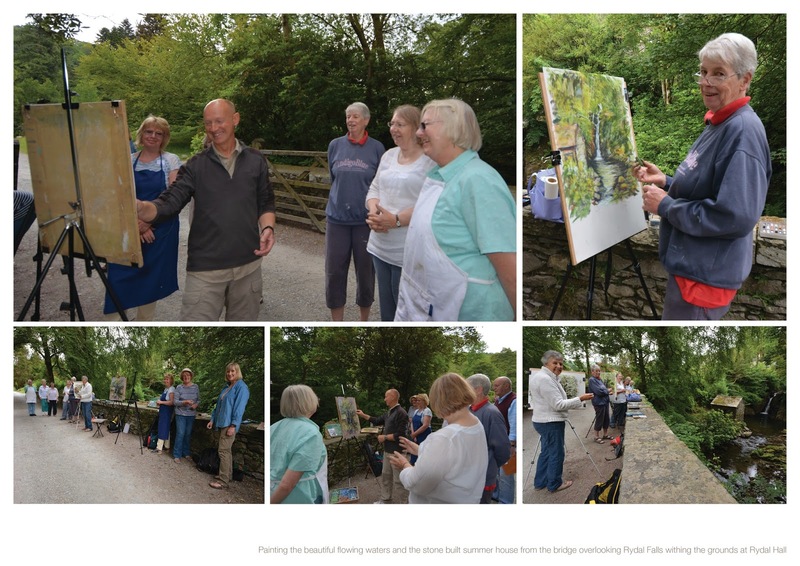 Viewing the idyllic scene from the bridge spanning the flowing waters in front of the fall soon after my initial pastel demonstration everyone working with the medium soon began to create some stunning paintings with many students using pastels for the very first time. The afternoon passed quickly but everyone really excelled and deserved their first of many sumptuous even Dinners in a relaxed setting in the prestigious dining room in the hall as we relaxed in each others company. The following morning after a lovely breakfast we headed for the waterfall again. The weather was still kind to us and the finishing touches to everyone’s pastels completed some super work! 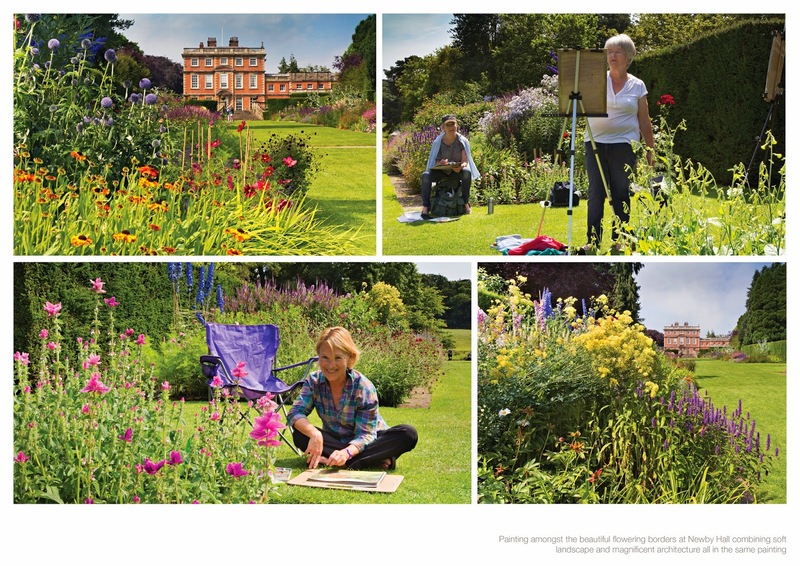 En plein Air painting proving that outdoor work really sharpens everyone’s visual perception and drawing and painting abilities. After a wonderful lunch (with a break mid morning for fresh coffee and home made cakes at the Hall by the way) everyone was eager and ready for the afternoon mixed media painting to begin! 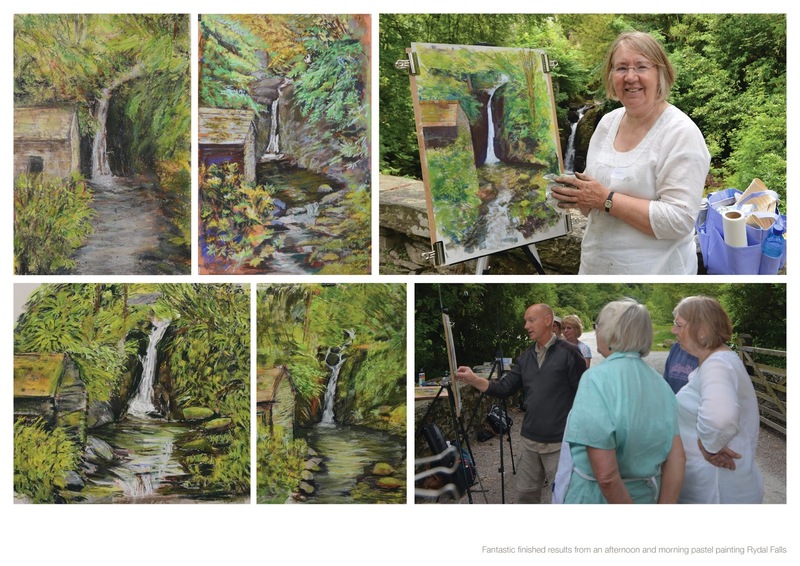 The exciting interchange between pastels, watercolour and gouache kept everyone’s on their toes with excitement as they watched their mixed media paintings of the waterfall develop through the afternoon. With memories still fresh and their finished on site pastels as perfect colourful reference and lots of creative techniques explored the finished paintings looked great! Rydal Water beckoned so the following day we strolled down to the bottom of the hill just outside the grounds of Rydal Hall and set up position lakeside. We were all greeted with the most magnificent still waters of this idyllic little lake - the reflections were quite superb! With one to one and group tuition throughout the day everyone once again created some exceptional work. 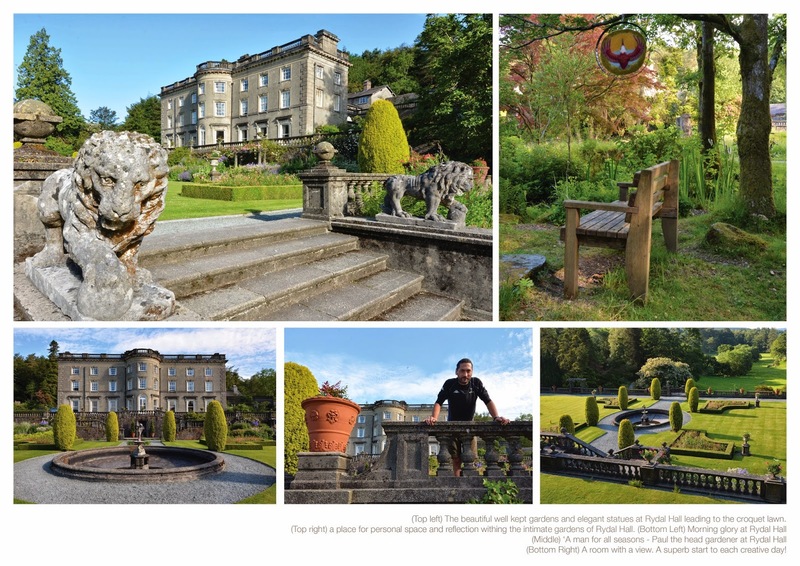 The 5 day creative break at Rydal Hall was just fantastic and with such great feedback we are set to have more creative fun at Rydal Hall June '15. 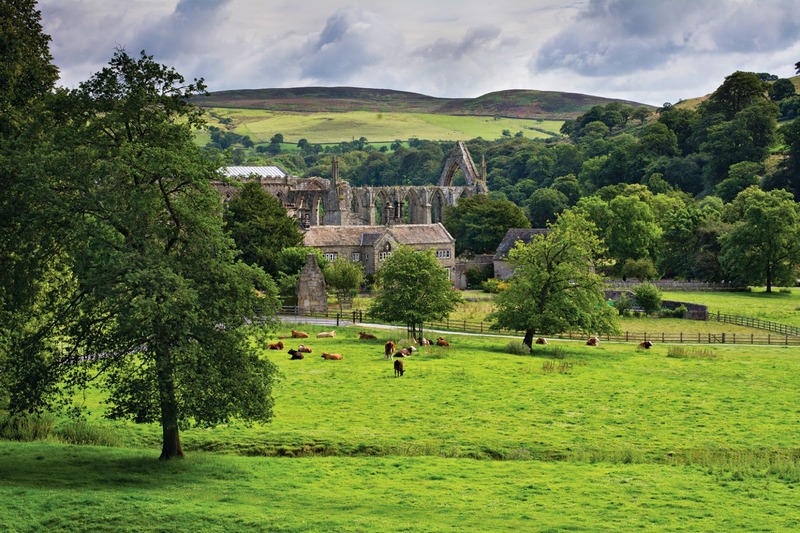 Return again 1-5 June 2015 and for Autumn colours on 12 - 16 October 2015. 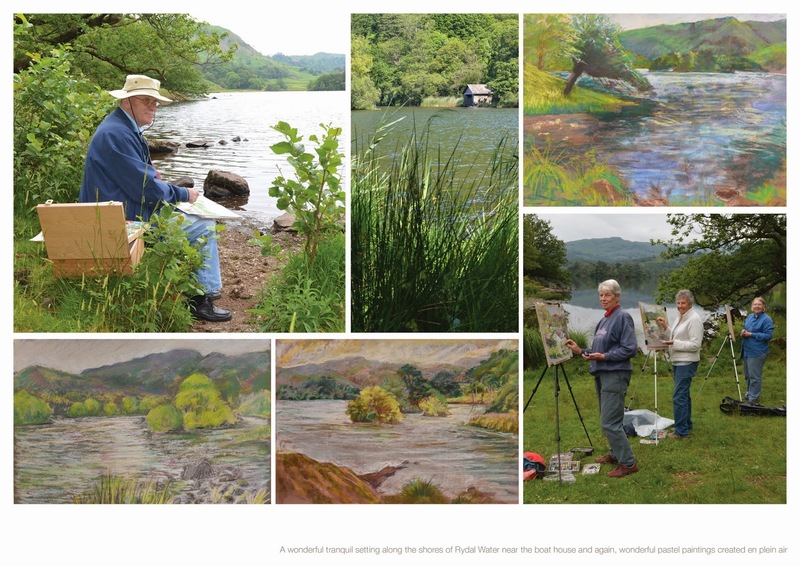 Two more exciting art holidays at Rydal Hall to look forward to in 2015! With limited places to just 10 students for each art holiday planned it’s a good idea to register your interest or book your place as soon as you can or you may miss out! 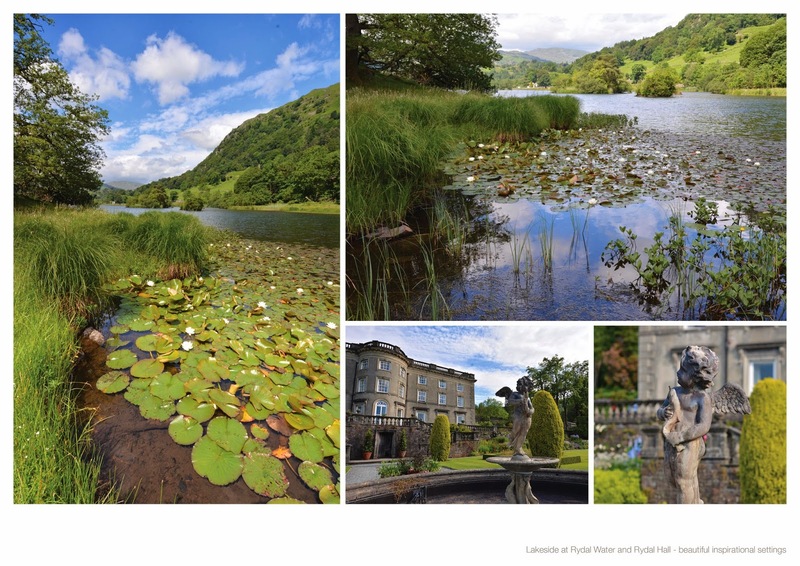 Rydal Hall, Rydal, Ambleside, Cumbria, LA22 9LX. Success at ‘Patchings’ open arts competition 2014. I knew I’d done a good one when I was half way through demonstrating this recent award winning painting for my students at one of my Autumn full pastel workshops at Follifoot village Hall last Autumn. It took me until April ‘14 to later finished it in the studio with the same vigour I’d shown in the class demonstrating. 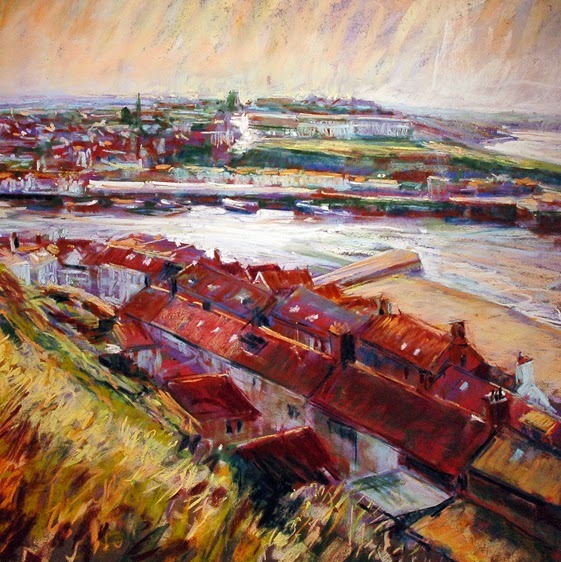 The topographical landmarks of the landscape had to be right but I didn’t let the accuracy the painting had to be slow me down - far from it, getting these things correct in the first place allowed me the freedom of expression to create the rest of the painting with vigour for the excitement felt on this bright windswept day as seen from the top of the magnificent natural amphitheatre of Malham Cove in the Yorkshire Dales. Roll on my next Dales outing and demonstrations for all in my next Autumn Follifoot workshops! Who knows what they might inspire my students to do too! 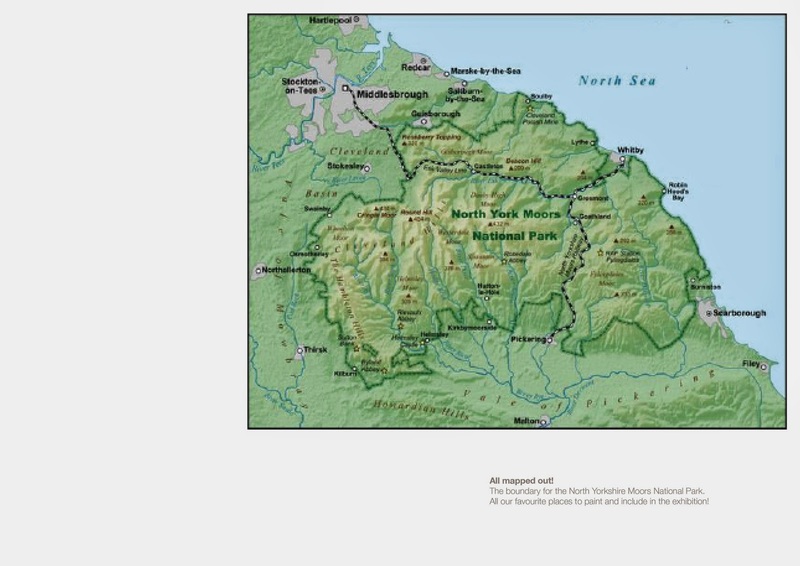 We have learned that we have been successful with a proposal put together and presented to Sally Smith (Events and Exhibitions Officer) at ‘The Inspired Gallery’ at the North Yorkshire Moors National Park fellow artists and friends Kate Stephens, Jo Garlick and Helen Patterson and myself to put on a major exhibition. Fantastic! 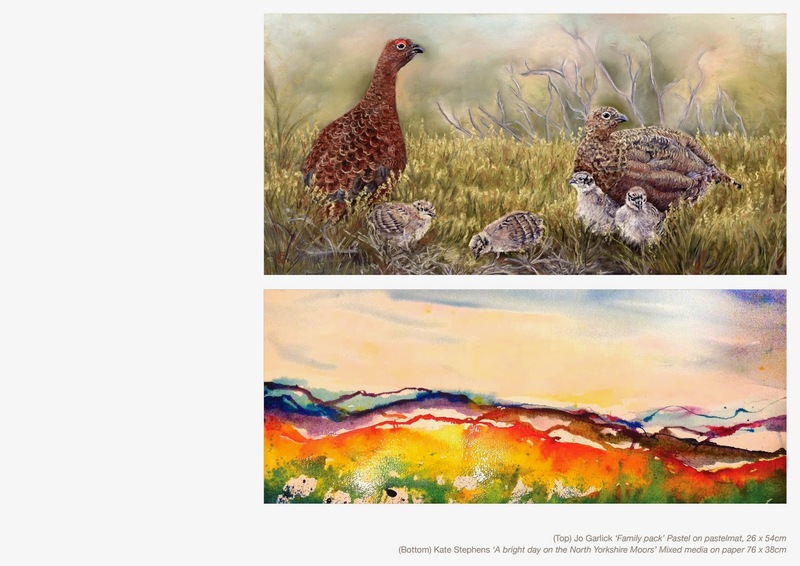 The vast majority of our work we will all be showing will have a North Yorkshire Moors inspired landscape and wildlife paintings theme with lots of exciting intimate view points and wildlife subjects as well as the bigger landscape panoramas - especially from Sutton Bank! 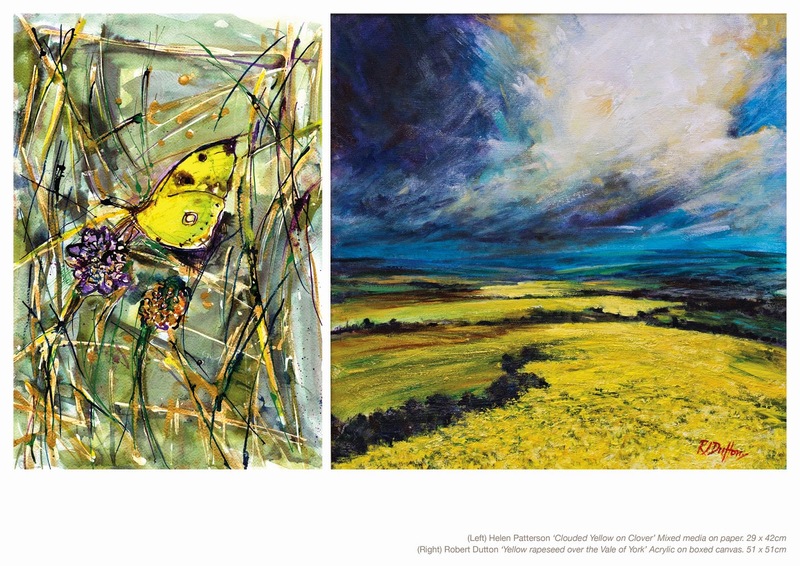 The exhibition will run Friday 17th April until Monday 4th May 2015 and with each of us showing at least 10 paintings each of different sizes, subjects and with different media this will be a very exciting and visually stimulating show indeed. The title of the show is ‘All Paintings Great and Small’ and is an obvious play on words from the superb series ‘All Creatures Great and Small’ which we all just loved! 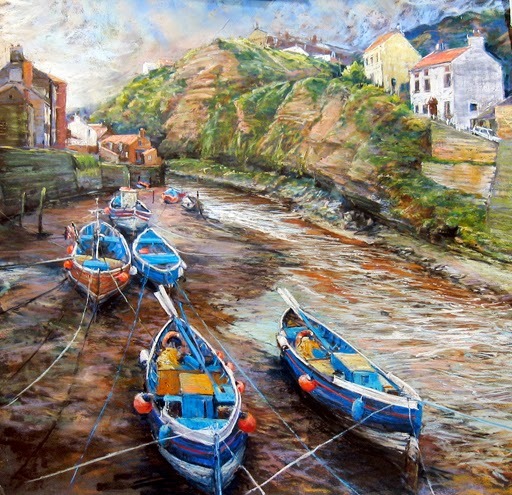 Many paintings will also feature places seen in the series - you’ll just have to come to see the ones we choose! This is our exciting exhibition space. I must admit, we are all thrilled! Who wouldn’t be. This is a fabulous opportunity for us to showcase our work all together and meet you all when you come and visit. A date for the diary indeed! At long last the sun came out and what perfect timing too! The first of my Summer workshops started in style on Monday 30 June with a fantastic days painting had by all. Making our way past the castle and through the grounds of this prestigious estate to the walled garden, looking over the wide terrace a wonderful pastoral scene was something to behold in the distance with cows drinking and cooling themselves in Ripley Lake. The scene reminded us all of the superb paintings by many of England’s great painters. A lovely brief respite on our way to the colourful walled gardens just a stones throw away just round the corner. 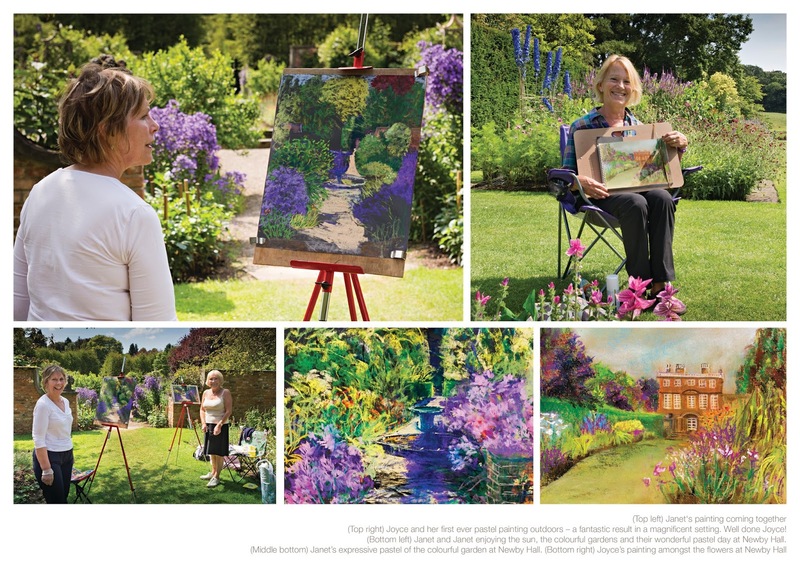 Choosing a weekday to paint we very much had the gardens to ourselves and with a quick tour showing everyone the different compositions and choices for great paintings I soon chose one myself to give a brief demonstration to get everyone in their stride. 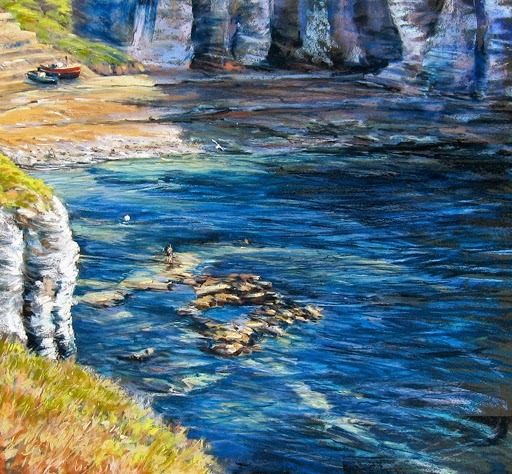 Choosing pastels for the immediacy and ease of mark making and painting, I explained as I demonstrated a wide variety of techniques to quickly build up a painting with sumptuous colour whilst capturing the essence of the scene. With everyone well under way soon after my demonstration and absorbed in their work, everyone created some amazing paintings throughout the day. With one to one tuition throughout it was great to see the paintings taking shape. The hours quickly passed and it was clear to see by the results at the end of the day just how much everyone had learned on the workshop and how much they had enjoyed themselves too. 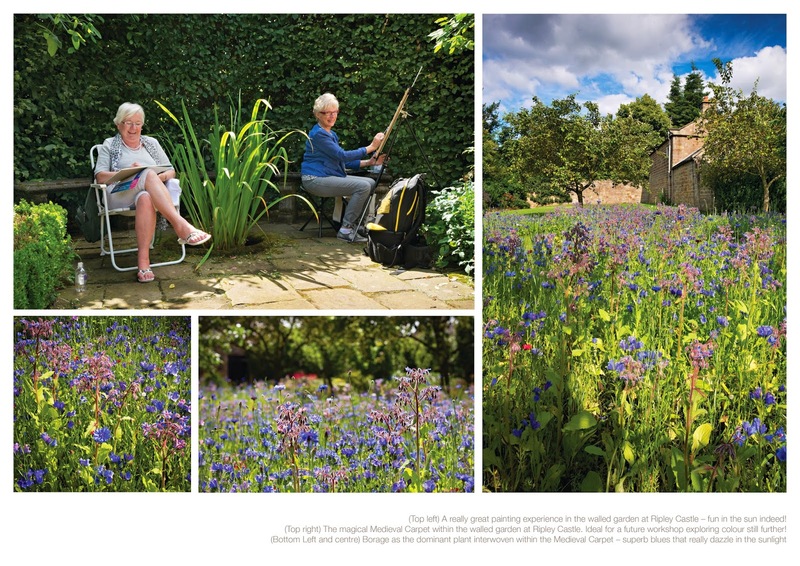 Roll on the next Summer workshop at Newby Hall Gardens, Near Ripon, North Yorkshire on Friday 11 July 2014. We are all in for another treat!